In his article, Down To The Sea Again, Alex Haley mentions the following: “Going to sea is my salvation. It’s the one place I know of where I can be reasonably isolated and have uninterrupted time to write. I always travel by freighter, staying out for a month or two at a time. The staterooms on freighters are very comfortable—some are really lavish—the food is great, and every trip is an adventure because cargo, not a set schedule, dictates a freighter’s movements. “If I could spend one month at sea and one on shore, I’d be in hog heaven. I’m not too far short of that. Right now I spend three or four months a year on freighters. I tend to repeat trips I’ve done before, taking the same cruise from Houston to Rio, then on to other ports in South America. Or I cross the Atlantic to Europe or take a run from California through the Pacific to Australia and New Zealand. “When you see the moon at sea, you feel that if you could just stretch a little farther, you could touch it. Sometimes Venus is visible up there too. If you stand very still, you’ll begin to feel this fine vibration coming through the soles of your shoes. And you realize with awe that it’s coming from the huge diesel turbine 35 feet under the water, driving the mammoth ship like a small island through the ocean. And if you keep standing there a little longer, you’ll hear a soft hiss as the skin of the ship cuts through the resistance of the sea. Where perennial enthusiasm is concerned, I’ll say I’m in the front ranks of freighter buffs. I try to sail at least two voyages yearly. I block out four to six weeks during summers and again during winters, usually helped by the holidays. Christmas for me, I like to say, is when I get a book finished. You see, I seem to write my very best out on the oceans, anywhere that’s distant from appointments, telephones and the myriad other things that clutter our lives. I’d guess that about 80 percent of Roots was written onboard various freighters. 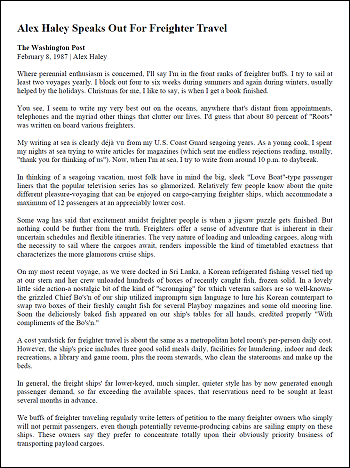 My writing at sea is clearly déjà vu from my U.S. Coast Guard seagoing years. As a young cook, I spent my nights at sea trying to write articles for magazines (which sent me endless rejections reading, usually, “thank you for thinking of us”). Now, when I’m at sea, I try to write from around 10 p.m. to daybreak. In thinking of a seagoing vacation, most folk have in mind the big, sleek “Love Boat”-type passenger liners that the popular television series has so glamorized. Relatively few people know about the quite different pleasure-voyaging that can be enjoyed on cargo-carrying freighter ships, which accommodate a maximum of 12 passengers at an appreciably lower cost. Some wag has said that excitement amidst freighter people is when a jigsaw puzzle gets finished. But nothing could be further from the truth. Freighters offer a sense of adventure that is inherent in their uncertain schedules and flexible itineraries. The very nature of loading and unloading cargoes, along with the necessity to sail where the cargoes await, renders impossible the kind of timetabled exactness that characterizes the more glamorous cruise ships. A cost yardstick for freighter travel is about the same as a metropolitan hotel room’s per-person daily cost. However, the ship’s price includes three good solid meals daily, facilities for laundering, indoor and deck recreations, a library and game room, plus the room stewards, who clean the staterooms and make up the beds. In general, the freight ships’ far lower-keyed, much simpler, quieter style has by now generated enough passenger demand, so far exceeding the available spaces, that reservations need to be sought at least several months in advance. We buffs of freighter traveling regularly write letters of petition to the many freighter owners who simply will not permit passengers, even though potentially revenue-producing cabins are sailing empty on these ships. These owners say they prefer to concentrate totally upon their obviously priority business of transporting payload cargoes. Among the features that make these freight ships so desirable for passenger voyaging is that their stateroom facilities often as not are even superior to the big cruise liners in their furnishings, decor, and general appointments and conveniences. Some of the larger freighters have adjustable air conditioning, for instance, and even a swimming pool. Beyond this, the freighters’ uncertain schedules offer that sense of adventure. The phrase “on or about” is a recurrent phrase in freighter scheduling discussion. It is not at all unusual for a freighter to be sailing at topmost speed, trying to make up that day or so that she is running behind the originally conjectured schedule. It is no less unusual that as she pushes for speed, other port stops may be added, and some already scheduled may be canceled en route. The ultimate example of these uncertain and flexible itineraries may be American President Line’s “vagabond voyage,” which is coveted among freighter buffs. The big cargoliners—there are five ships in this service—operate in the classic old tramp-steamer manner, sailing wherever there are financially luring cargoes. The fares are based on a voyage of 80 days (90, beginning April 1), with a refund on a per-diem basis should the voyage be any shorter. But one of last year’s vagabond cruises kept on going for about five months, during which time it stopped at nearly 20 different world ports. After nearly three years on the waiting list, I am supposed to sail this voyage during the winter and spring of 1988, and it is all that I can do to wait. As recently as 20 years ago, dozens more freighters carried passengers than do now. Their numbers have become so sharply diminished primarily because of the 1960s development of the oblong metal containers that are each able to hold and protect a heavy tonnage of cargo. Freight ships previously carried either bulk or loose cargoes. In those days, the loading or unloading gangs—sometimes of hundreds of men—had to hoist one by one the thousands of bales or bags or boxes or cartons, so without question the freight ships would remain at each cargo-handling port for periods of time, sometimes ranging even into several weeks. Back then, such a freight ship’s passengers could roam and shop and take tours to their hearts’ content. But nowadays a shipper pre-loads his export products into the metal containers, which are as big as truck bodies. The containers, sealed and locked, are then delivered to their pier, where huge cranes directly load them either into the transporting ship’s cargo holds or upon its wide steel deck, where the containers are tightly secured by stanchions. In some of the major shipyards that tend to compete with each other for efficiency, a major ship can be loaded or unloaded, or both, within a single day. In the preeminent cargo-handling ports, such as Japan’s Yokohama and Kobe, which seriously compete for new records, the art of a seemingly endless line of trucks moving under the giant cranes plucking huge containers off the enormous freight ships to deposit them one by one onto the trucks’ beds is not far from the grace and beauty of ballet. Freighter passengers find a fascinated pride in the modern technologies that wreak such change in the old ways and practices of the maritime industry, none of them more so than another variation of the container, the refrigerated ones, which are called “reefers” in the trade. The “reefers” can keep truckloads of perishables at any desired temperature, from crisply chilled to frozen rock solid—indefinitely if required. Different past pierside witnessings come to mind, of seeing small, rugged commercial fishing vessels unload their freshly caught and frozen fish into containers that our ship would transport elsewhere. Once off South America we took on frozen tuna; another time in Alaska we loaded on three containers of thousands of tons of king salmon for Japan. Who are the average freighter buffs? I’ve heard of only a few other writers, scholars or other creative professionals who seek seagoing solitude in which to concentrate upon their work. By far most freighter passengers are retired couples or individuals, most of whom had traveled a lot by other modes before trying and falling in love with freighters. It’s such a very special feeling to be out where ocean is as far as you can see in every direction. So there is a lot of ocean-watching. At almost any time, a halloo may go up, bringing fellow passengers hastening outside to share the thrill of a big school of porpoise frolicking amidst the ship’s curling bow wave, or maybe a big school of green turtles, or seemingly millions of anchovies rippling an acres-wide swath of ocean surface as little sea otters dart amidst them eating their bellies full. Whales are a special thrill for the ocean-watchers, as, of course, are occasional passing ships of odd types, including the modern giant oil tankers, which can seem like floating islands. But no sight quite tops the nighttime’s awesome beauty of the stars, constellations and planets. In the ocean’s clean, clean atmosphere, the firmament can seem both brighter and much closer than you’ve ever before witnessed. Of course these same sights are seen on the big cruise liners, but amongst freighters’ maximum 12 passengers, they seem more intimate. Inside the ship, the freighter folk tend to sleep a lot within their cabins, between the three solid meals a day—always with a choice of four entrees. Reading and playing cards are about equally popular, as is the traditional “Happy Hour” before the evening meals, where the passengers and officers dine together. The dinner over, passengers decide whether or not they want to watch the VHS movies on the TV screen. And usually some pair of ladies continues their unending challenge of the big, intricate jigsaw puzzles. In my years of voyages, most of my fellow passengers have been longtime married couples, usually grandparents, who relish their freedom and genuinely enjoy some worldwide adventuring together. Ages range from the fifties to the age 80 limit—which most freighter lines establish. It’s by no means unusual to meet freighter buffs celebrating fourscore on their last permitted voyage. How to book reservations for freighter voyages? You can book the voyage yourself, simply by calling the shipping line that owns the freighter that you like. But if you don’t know the menu of voyage potentials, and you prefer not to deal with the variety of forms and documents involved, then ideally your booking should be done by any of the few knowledgeable agencies that make a specialty of freighter travel. As an example, on one of my voyages the 12 passengers came from all across the United States, but at sea we discovered that 10 of us had booked through the outstanding agency Freighter World Cruises Inc. of Pasadena, Calif. The sea can hook you so easily, starting with the very first time you stand up there at the rail of your very first big, deep-water ship, as it readies to leave the pier. The tugboats are whistling their taut message exchanges, as their propellers boil tons of water, pushing or pulling with their incredible power to aid the great ship’s movements. You begin to perceive the giant ship gradually inching clear of the pier, like some great seaborne dinosaur, and it can only be termed majestic. You’re away up high over those folks standing down there on the pier, and you study their faces gazing upward. Something about any great ship’s leaving makes those faces—of grade-school kids and corporate executives alike—mirror their yearnings. Just then, your big ship’s horn blasts her deep-voiced notice that her last restraining line has been cast off, and nudged, pushed, nursed, pulled by the straining tugboats she’s now drawing out toward the ship channel. Purely instinctively, you can’t help languidly waving down toward those land-bound yearning faces, and instantly they wave back, as if grateful that you even briefly noticed them. You feel so good, so proud and tall up there, that if you’ve any heart, any sense at all, it’s you who are feeling grateful. ~ Alex Haley.